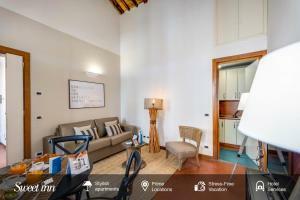 Location is excellent - right next to Via Del Corso. The location was central, the room was really comfortable even for four people we were (2 in the bedroom and two in the sofa bed) . Location was great. Major attractions really close. Only Vatican and Colosseo a bit further - 35 minutes walk but wasn’t a problem. A lot of luxury shops in the area. Very nice restaurants and coffee shops as well. Very strong air condition. NUXE toiletries. 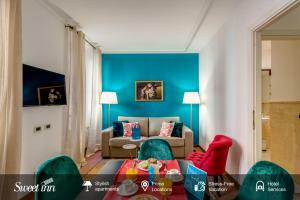 Sin duda lo mejor del apartamento es la ubicación, está en pleno centro y puedes ir a pie a todos los sitios. El apartamento está bien decorado y las camas son cómodas. La posizione è davvero ottimale per visitare la città a piedi. Rapporto qualità/prezzo/posizione davvero interessante. El apartamento tenía Wifi y Netflix una muy buena opción ante la tv italiana. La cama y el sofá cama muy cómodos. La cocina es muy pequeña pero tiene lo necesario. Al llegar michele nos dejó dos botellas de agua de cortesía y capsulas para la cafetera. La ubicación es ideal, justo al lado de la calle corso, arteria principal para hacer shopping y puedes llegar fácilmente andando a los diferentes puntos turísticos de la ciudad, tales como plaza españa, plaza popolo, fontana de trevi y panteón. 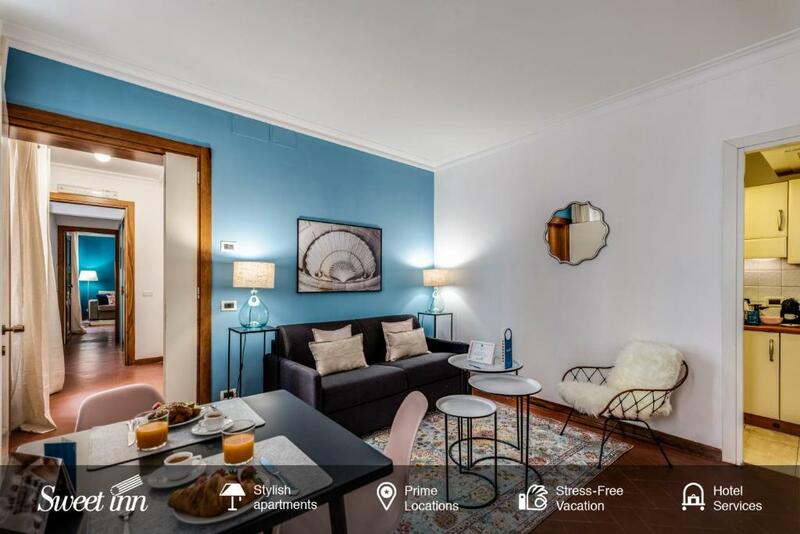 Located in Rome, Sweet Inn- Via dei Greci provides accommodations a 3-minute walk from Via Margutta and half a mile from Piazza del Popolo. Complimentary WiFi is featured. Each unit comes with a fully equipped kitchenette with a toaster, a seating area with a sofa, a flat-screen TV and a private bathroom with shower and free toiletries. A fridge and stovetop are also available, as well as a coffee machine and an electric tea pot. Via Condotti is 1.2 miles from the apartment. Ciampino Airport is 12 miles from the property. 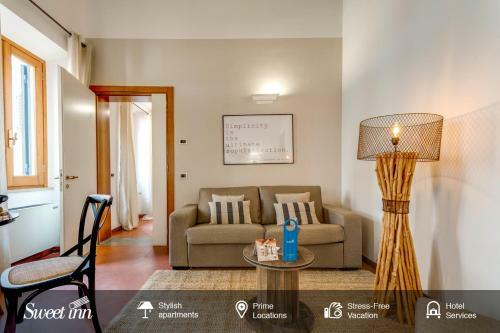 When would you like to stay at Sweet Inn- Via dei Greci? 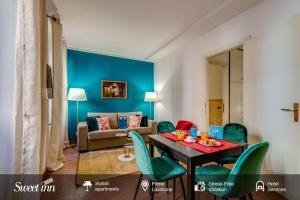 This apartment has a kitchenware, seating area and flat-screen TV. 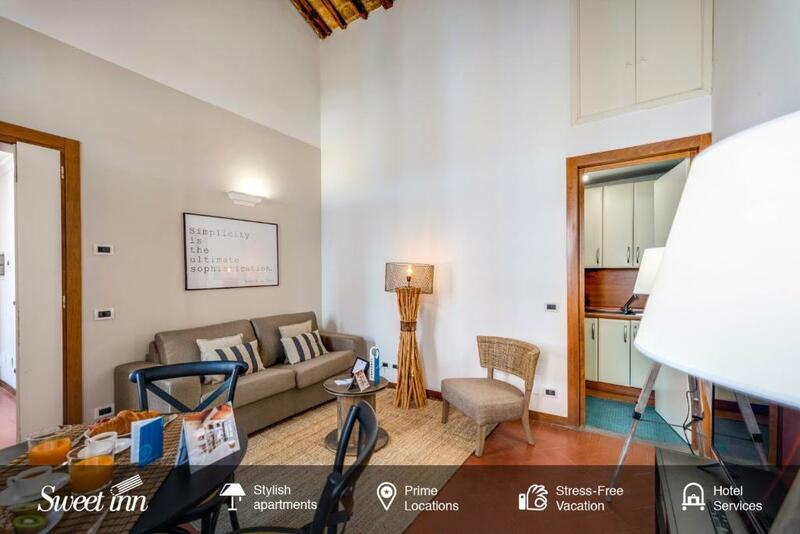 This apartment has air conditioning, seating area and kitchen. This apartment features a seating area, flat-screen TV and stovetop. 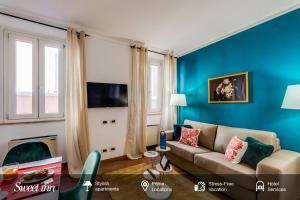 These elegantly designed apartments provide guests with a comfortable home in the heart of Rome. 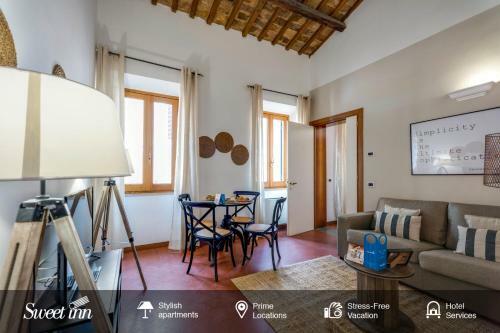 A 5-minute walk brings you to the central Piazza del Popolo, and the Spanish Steps are a 5-minute walk in the other direction, with many other museums and historic sites along the way. Here in the historic Spanish Steps neighborhood, restaurants and boutiques line the streets, and subway and light rail stops are nearby. Inspired by the art and culture of the Italian Renaissance, our local interior designer has created spaces as elegant as the paintings of Giotto. In the building, we offer 1-bedroom and 2-bedroom apartments, each with a double sofa bed to accommodate extra guests. Premium amenities include free WiFi, cable TV, luxury toiletries, hotel beds and linens, and a Nespresso machine. Perfect for couples, solo travelers, and business guests. Often referred to as the Tridente because of the three roads that branch out from Piazza del Popolo, the Spanish Steps neighborhood is Rome’s centermost district. 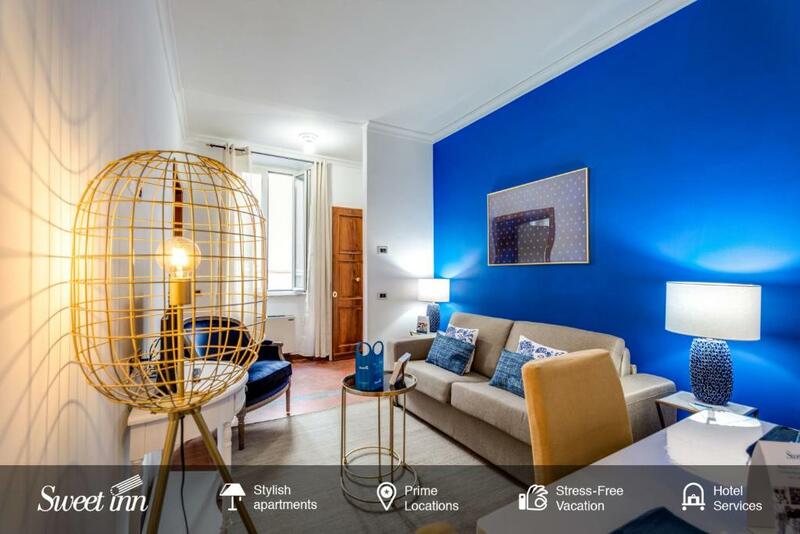 Famous for its Spanish Steps (Piazza di Spagna), a monumental site which draws tourists and locals alike, it is also home to some of the city’s most upscale shopping streets, such as Via Condotti. This elegant area of the city is full of designer stores, trendy restaurants, and expensive hotels. 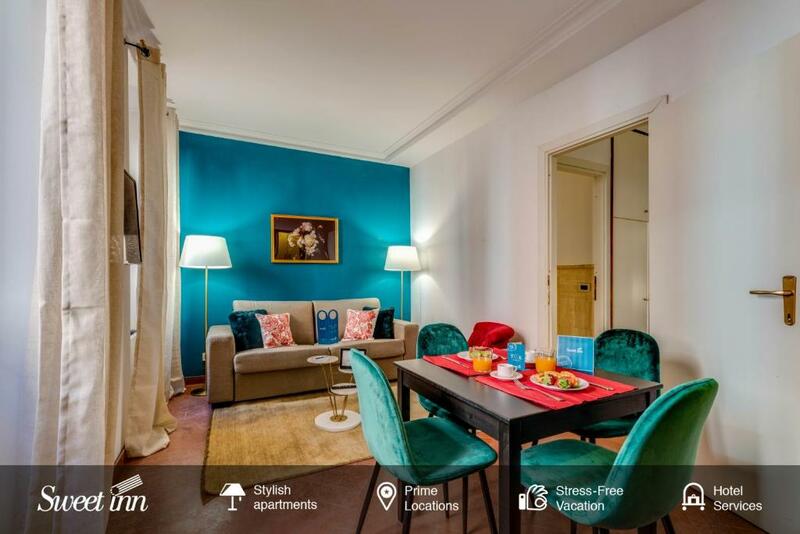 If you want to experience the true heart of Rome, this is a great choice. House Rules Sweet Inn- Via dei Greci takes special requests – add in the next step! Sweet Inn- Via dei Greci accepts these cards and reserves the right to temporarily hold an amount prior to arrival. A damage deposit of EUR 350 is required on arrival. That's about 393.52USD. This will be collected by credit card. You should be reimbursed on check-out. Your deposit will be refunded in full by credit card, subject to an inspection of the property. Sofa Bed linen was dirty and stained. Bathroom floor was dirty. Reported the incident to the Sweet Inn lobby and via e-mail but linen was only changed on the 3rd day of our stay, and floors remained dirty throughout. Cleanliness was disappointing. The bathroom was a bit dirty. Problem with the amenities, there were three of conditioner for the hair and nothing of shampoo or bath gel. We stayed for 5 nights and they only cleaned the room before we entered not even once during our stay. It was a bit difficult to communicate with the hosts on spot. No reception. Not very clean rooms. Apartment we got wasn’t that nice as it looked on the photos but I got a chance to see the apartment opposite ours. It was really big, clean and nice furnished. Having one key to access the main door was a hassle when you are traveling with a group. A keypad would be very helpful.